JACKSONVILLE, FLA., Dec. 14, 2015 (GLOBE NEWSWIRE) -- Drone Aviation Holding Corp. (OTCQB:DRNE) ("DAC" or "Drone Aviation"), a manufacturer of tethered drones and lighter-than-air aerostats today announced that the WATT-200 tethered drone has been approved by the FAA for operations by a major news organization. Jay Nussbaum, Chairman of Drone Aviation stated, "We are extremely pleased with the FAA ruling which paves the way for news organizations to utilize WATT to capture compelling video scenes, securely streamed down our armored tether directly to audiences around the world. We look forward to working with an industry pioneer and actively supporting their ongoing efforts to introduce innovative technologies into the broadcast media industry." DAC's WATT-200 is engineered and manufactured to operate safely in urban environments and securely provide live, broadcast-quality aerial video. 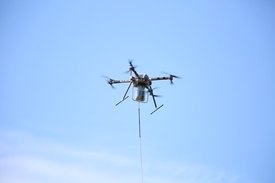 The unique, high-strength armored tether connects the aerial vehicle to a ground power source for long flight durations and acts as a leash for additional safety. Unlike hobbyist consumer and "prosumer" drones, the WATT-200 delivers military grade, highly-stabilized HD video even in adverse weather conditions. The robust and easy to operate design of WATT's hardware and software systems are based on years of experience gained from delivering tethered aerostat systems to various U.S. Government and Army customers. The WATT series of systems are intended for a wide range of applications including newsgathering, emergency first responder/search and rescue, military and border protection. Drone Aviation Holding Corp. (DRNE) develops and manufactures cost-effective, compact and rapidly deployable aerial platforms including lighter-than-air aerostats and electric-powered drones designed to provide government and commercial customers with enhanced surveillance and communication capabilities. Utilizing a proprietary tether system, the Company's products are designed to provide prolonged operational duration capabilities combined with improved reliability, uniquely fulfilling critical requirements in military, law enforcement and commercial and industrial applications. For more information about Drone Aviation Holding Corp. please visit www.DroneAviationCorp.com or view our reports and filings with the Securities and Exchange Commission on http://www.sec.gov, including the Risk Factors included in our Annual Report on Form 10-K for the fiscal year ended December 31, 2014, as well as information about the Company in our Quarterly Reports on Form 10-Q and Current Reports on Form 8-K.